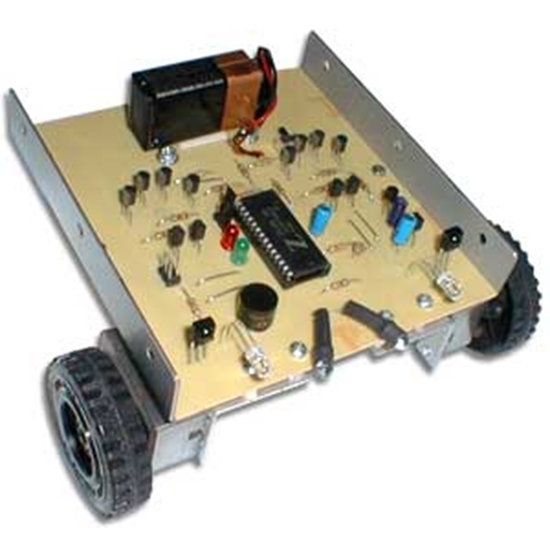 The Microcontrolled IR Remote Controlled Robot Kit uses a 28 pin Zilog Z8F0423 microcontroller featuring 4K of flash memory and 1K of RAM. It has a program written in the industry standard "C" programming language using ZDS II, a freely downloadable development suite. The program code with comments can be printed out so that you can view the code that operates the Robot giving you an introduction to microcontroller program basics. The pre-programmed the Zilog microcontroller has two separate modes of operation. In the autonomous mode, the Robot explores any area which has a solid level floor (even most carpets except deep pile types). In this mode it features two IR sensors to detect objects in its path and can back up and turn left or right. It even has two white headlights that automatically come on when its dark. In the Robot's other mode of operation, almost any brand of TV/VCR IR remote can be used to remotely control its operation. From up to 20 feet away, you can press any button on your IR remote to control the Robot's response. One press and the Robot goes forward. Two presses and the Robot goes backwards. Three presses and the Robot turns left. Four presses and your Robot turns right. Five presses and the headlights turn on. The mode at which the Robot operates in (autonomous of IR remote controlled) is selected by a small moveable shunt jumper. The Robot is about 4.9" x 5.1", and uses two powerful gearhead motors, a built in piezo sounder, red, green and white LEDs, transistors and voltage regulators. Operates from one 9V battery (not included). Comes with a CD which has the program files if you wish to view them. Although not necessary for the operation of the Robot, advanced students can buy an inexpensive USB programmer from Zilog distributors which allows you to create your own programs for the robot or it will allow you to step through the program code that we have used and watch it execute. 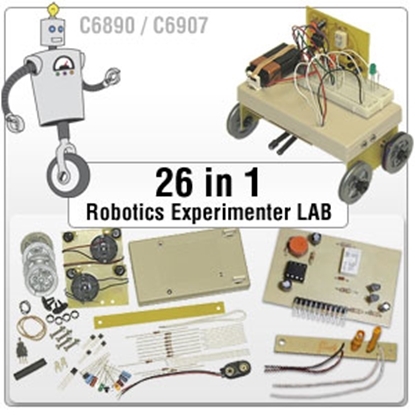 Complete kit includes all parts, PC board, pre-programmed IC, source code used for robot and instructions. How do I order the Microcontrolled IR Remote Controlled Robot Kit? 2. Or you can call us at (800) 321-2155 and ask for product 02-618.